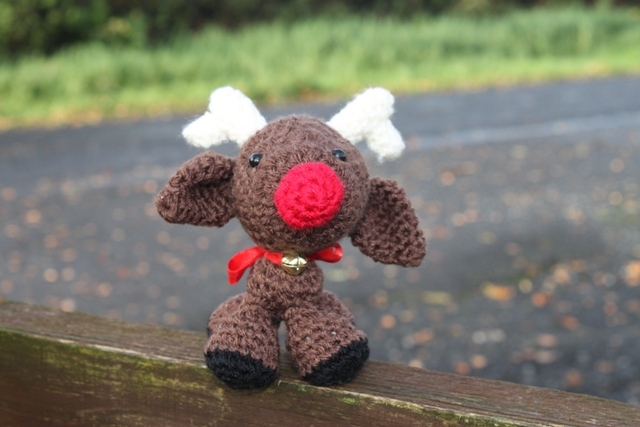 Santa has enlisted the help of a new reindeer this Christmas. 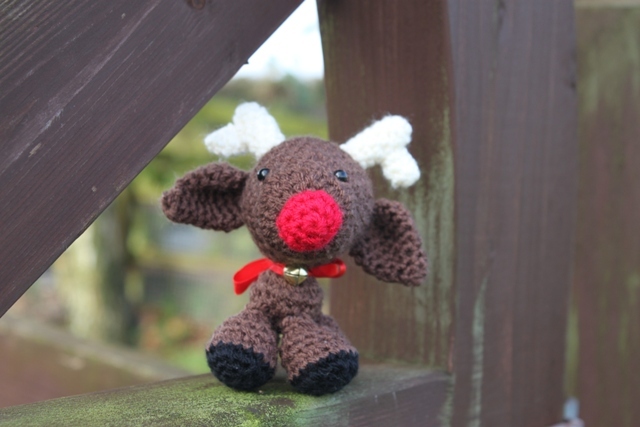 He’s a reindeer called Rusty. Rusty is a very special little reindeer. For although he is small he is kind and brave. 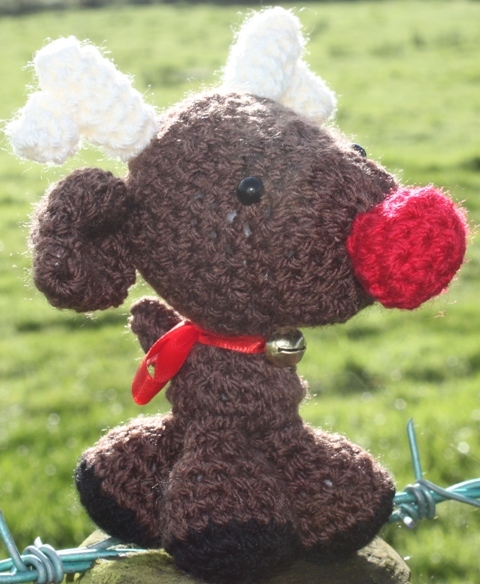 He is never afraid to help out his fellow reindeer and looks after all the younger reindeer helping them to fit in. He was top of his class in reindeer training class and is an excellent flier and he is ever so excited about making it to Santa’s squad of flying reindeer. He simply can’t wait for Christmas Eve to come. 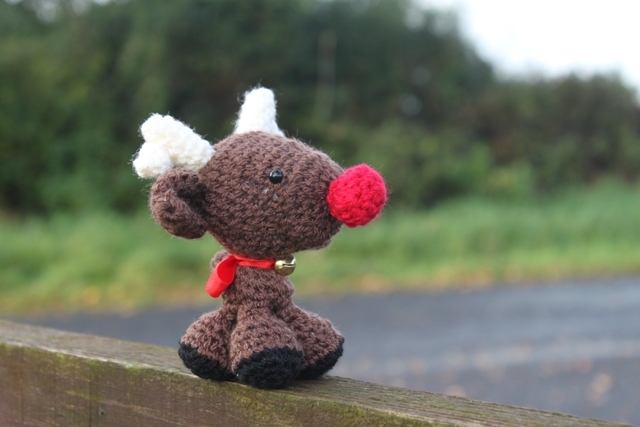 He may seem small but he’s very strong which makes him perfect for helping to pull the sleigh on Christmas Eve. I think Rusty will be a great helper for Santa don’t you ? Rusty is a little bit nervous about his first Christmas Eve as well though. For so long he has heard about all Santa’s reindeer and the wonderful job they do pulling the sleigh with Santa, toys and gifts for all the boys and girls throughout the world. It’s a lot to live up to and he hopes he can do the job, but I know that with a hug and a cuddle he will do a great job. On Christmas Eve when you are all snuggled down in bed and the house is all hushed with the quiet of night. When you hear that tinkle of bells overhead like magic and if you dare to peek out through the window you may see a red shiny light shooting across the sky. You will know that Rusty is pulling that sleigh ! 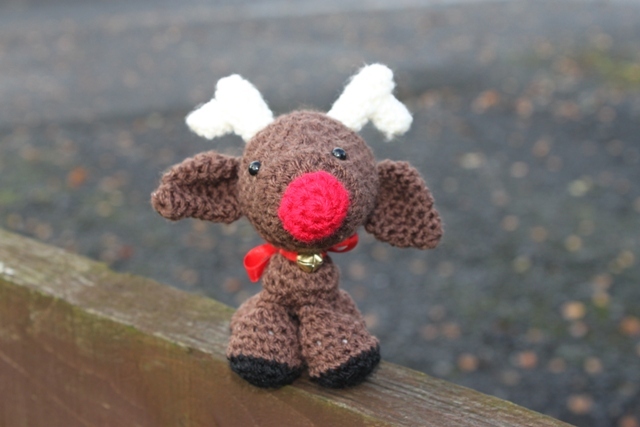 Rusty stands at 4.5 inches tall and is made from acrylic yarn. He’s got 100% polyester toy stuffing and has two safety eyes and a little bell round his neck. He was taken from the pattern Rudy the red nosed reindeer. 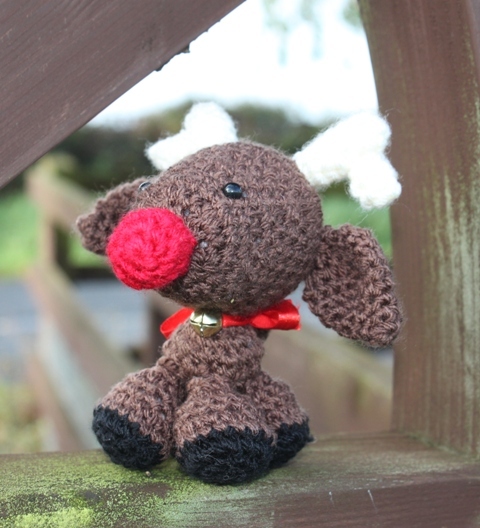 This entry was posted in Crochet, Finished object, Uncategorized and tagged Christmas, Christmas Eve, Reindeer, Rusty Reindeer., Santa Claus, Santa Claus's reindeer. Bookmark the permalink. Oh, he is so cute! I love him! I think he’ll do a fantastic job! And he’s so cute! He can come to my house for a reassuring hug anytime. 🙂 Awesome work honey, he’s a charmer.